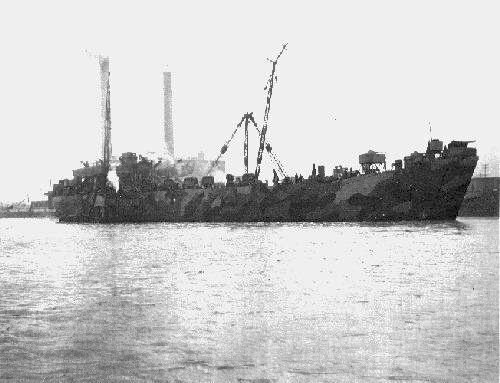 Laid down, 28 December 1944 at Mission Valley Bridge and Iron Co. Evansville IN. 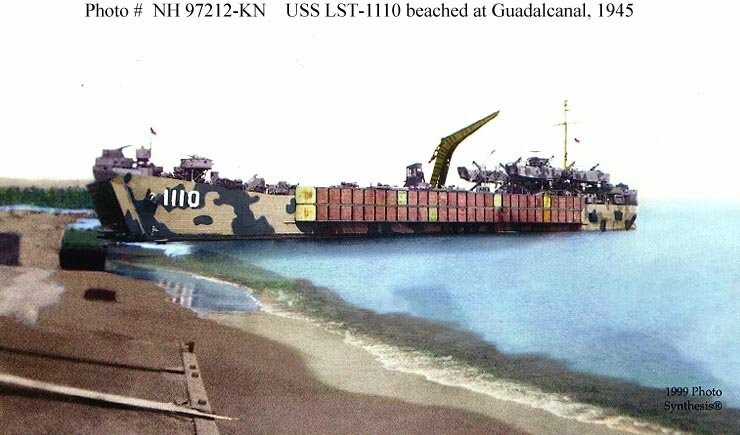 40k USS LST-1110 nested with four unidentified LSTs, date and location unknown. 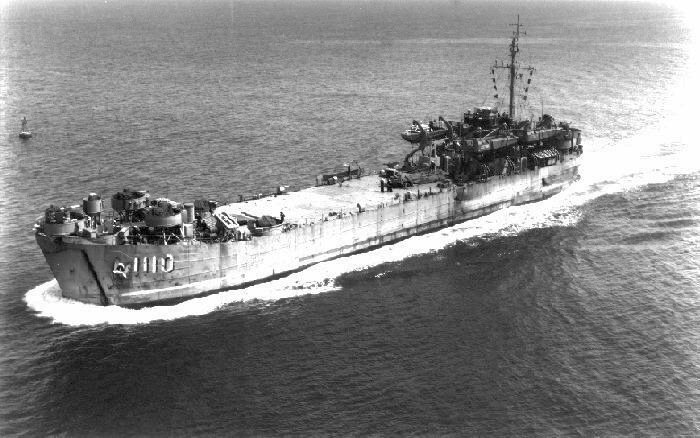 51k USS LST-1110 at anchor, date and location unknown. 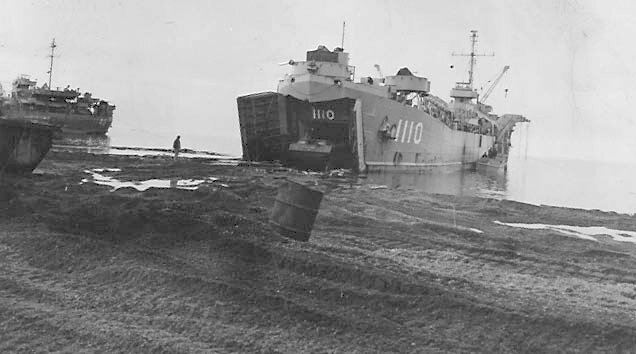 42k USS LST-1110 beached at Guadalcanal, date unknown. 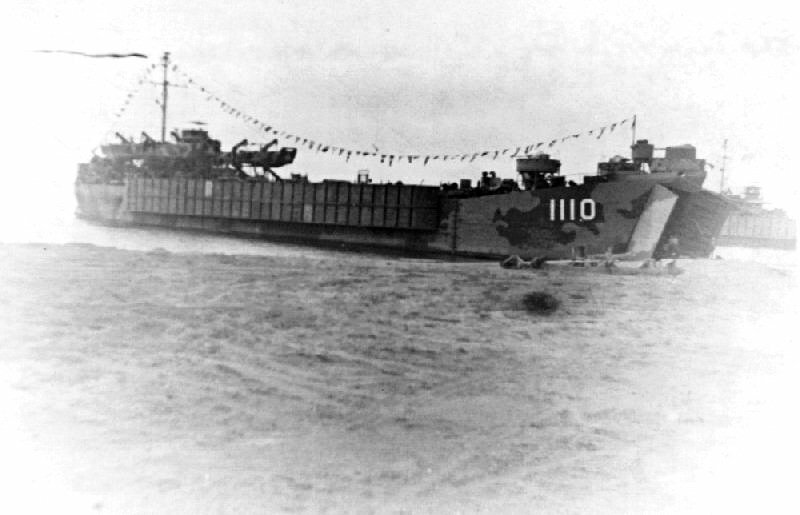 31k USS LST-1110 underway, date and location unknown. 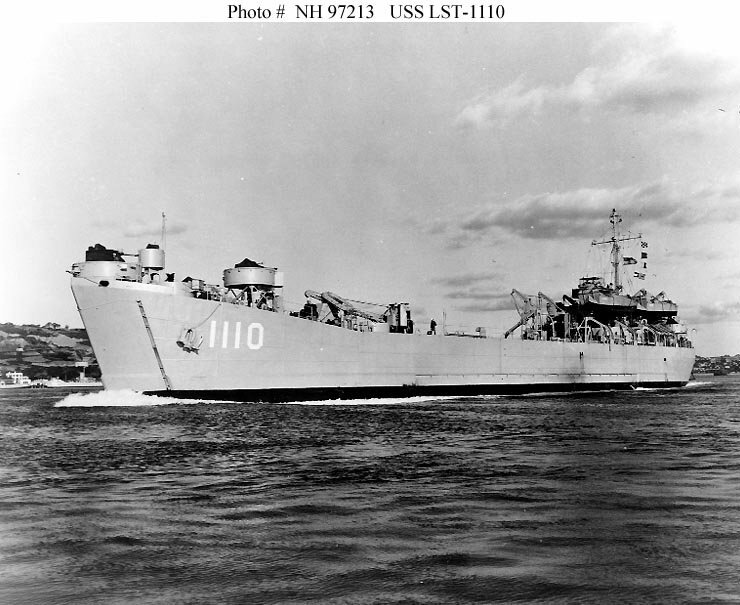 67k USS LST-1110 underway, date and location unknown. 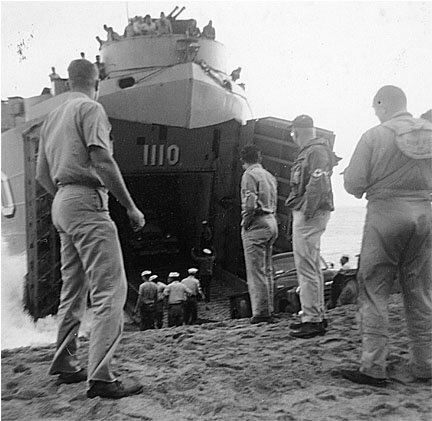 45k USS LST-1110 beached in the Hawaiian Islands, date unknown. .
67k USS LST-1110 at West Kukum Beach, Guadalcanal, 18 August 1945. This photograph, originally black and white, was color-tinted prior to its donation to the Naval Historical Center. Donated by James C. Anderson, December 1999. 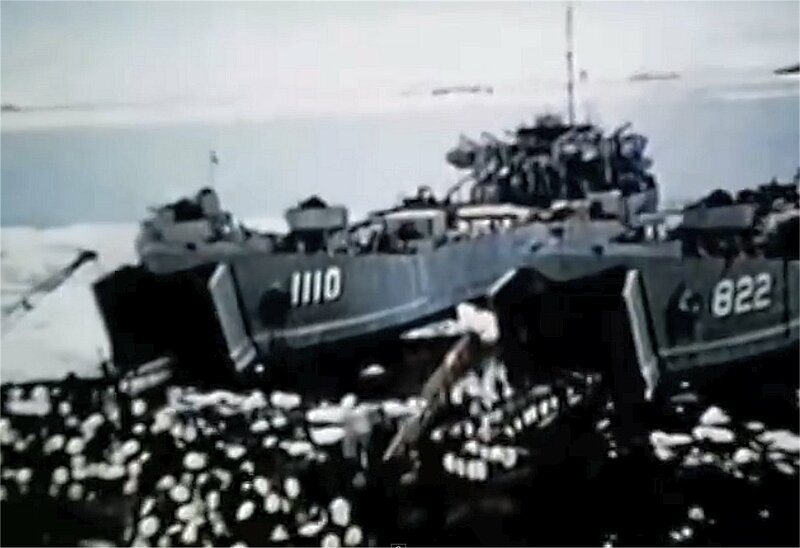 93k USS LST-1110 photographed during the later 1940s or early 1950s, probably in San Diego harbor. 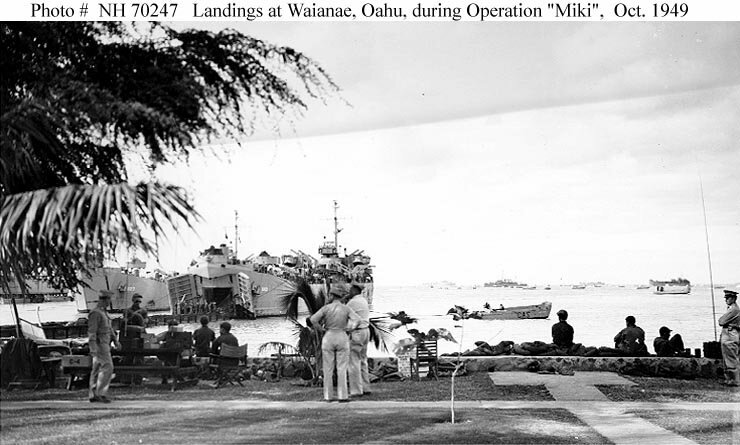 This image was received by the Naval Photographic Center, December 1959. 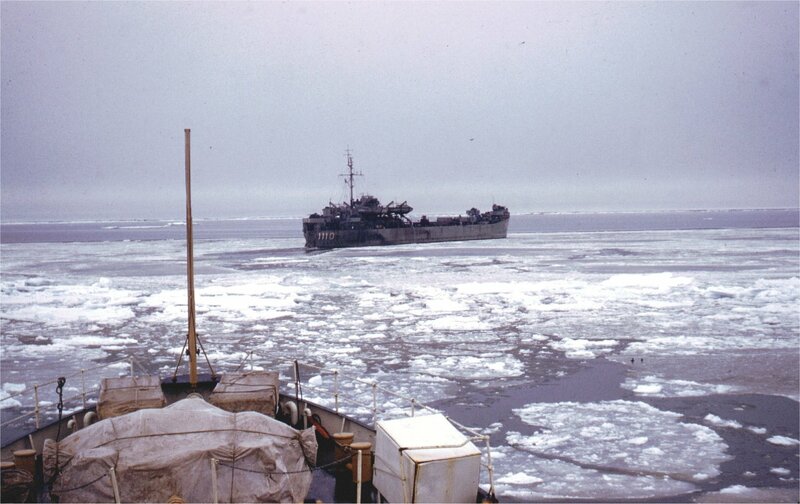 US National Archives photo # 80-G-685926 111k USS San Bernardino County (LST-1110) underway in a consolidated ice belt, northeast of Point Barrow, Alaska, during "DEW" Line support operations, 11 September 1955. 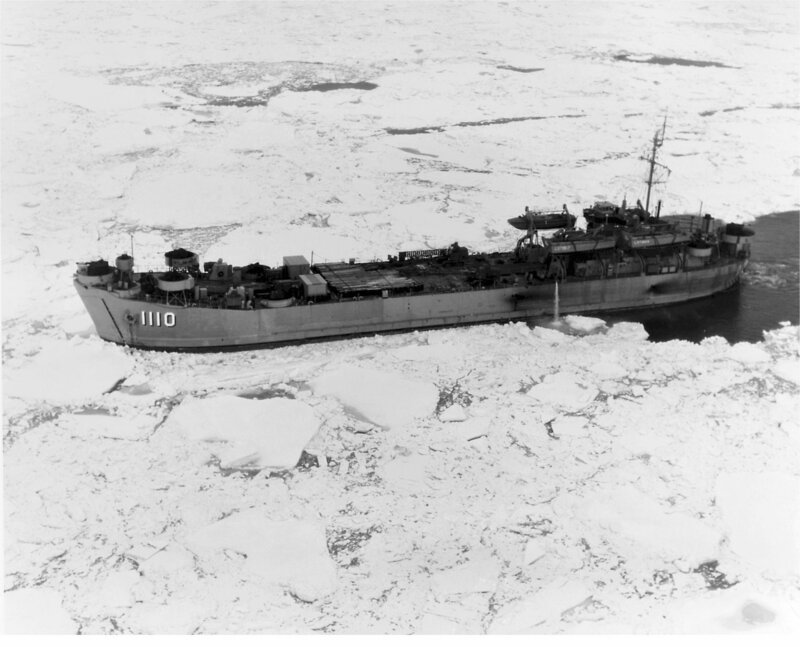 103k USS San Bernardino County (LST-1110) battles heavy ice as she waits for help from US Coast Guard icebreaker USCGC Bittersweet (WAGL-389, during "DEW" Line support operations, 11 September 1955. US Navy photo from "All Hand" magazine, June 1956. Joe Radigan MACM USN Ret. 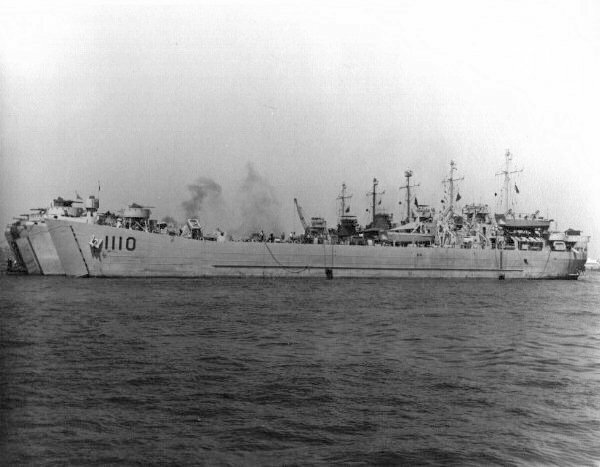 111k USS San Bernardino County (LST-1110) underway during "DEW" Line support operations, September 1955. 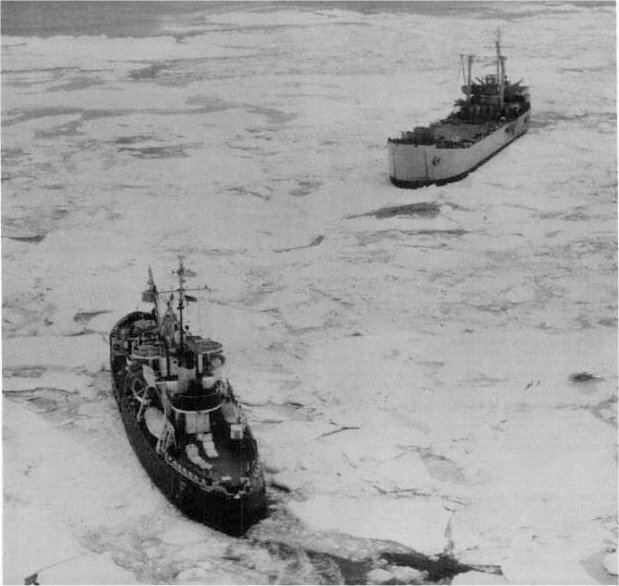 USCGC Bittersweet (WAGL-389 is doing the icebreaking. Photo by LTjg. 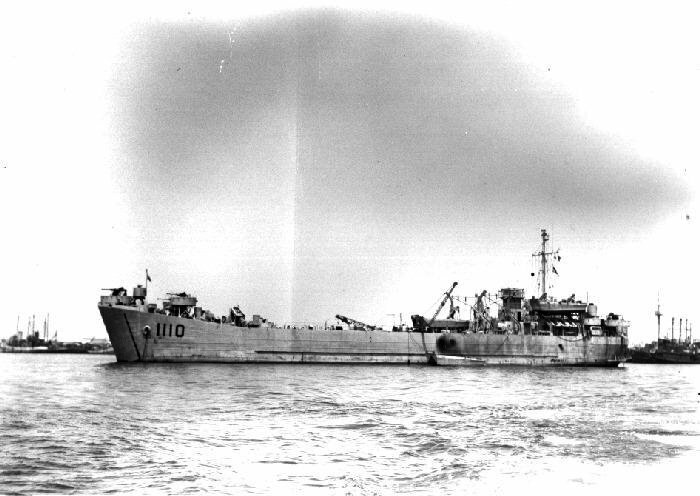 Ernest Fuller USCGC Bittersweet. David Fuller for his father, LTjg. Ernest Fuller USCGC Bittersweet. 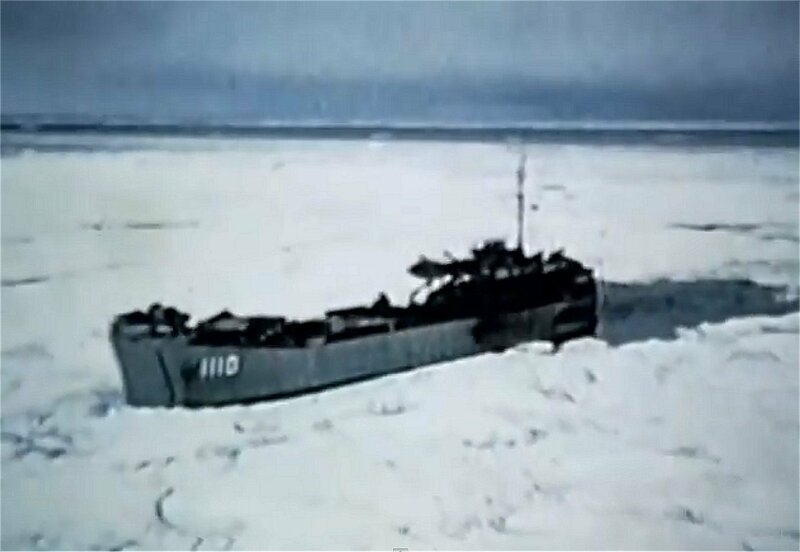 60k USS San Bernardino County (LST-1110) follows USCGC Bittersweet (WAGL-389 through the ice off Point Barrow, Alaska, to supply one of the radar stations of the DEW (Distant Early Warning) Line, 1955. Note the large concrete block suspended from Bittersweets buoy boom. 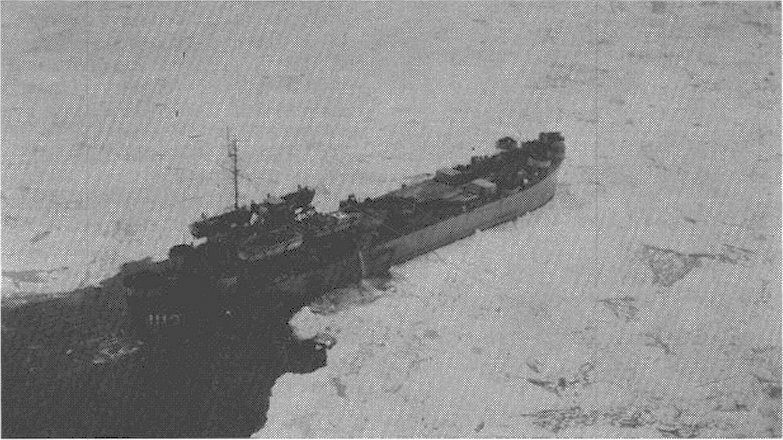 Before the days of ballast-shifting tanks, icebreaking buoy tenders, such as Bittersweet, would suspend a weight from the boom and shift it from side to side to 'rock' the ship free if it became beset in ice. 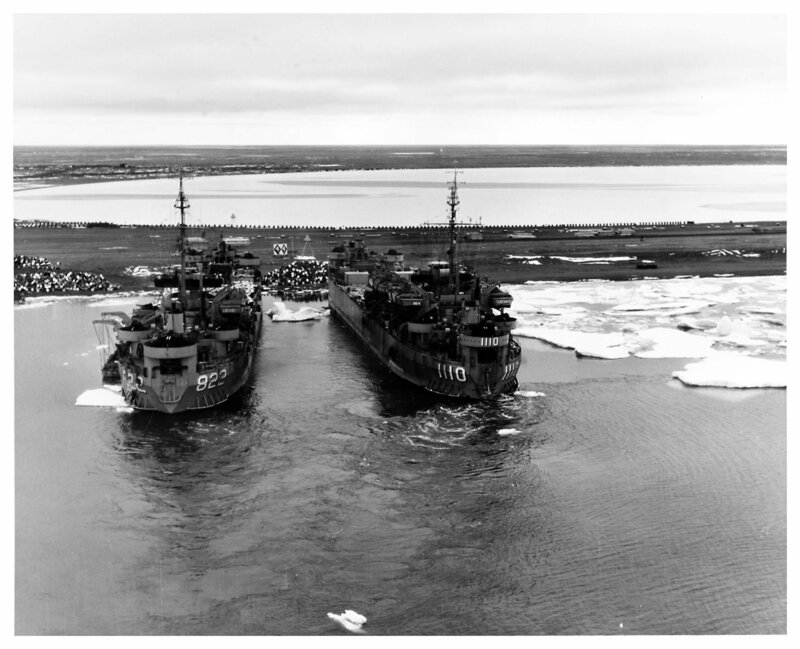 US National Archives photo # 80-G-685966 104k USNS Harris County (T-LST-822), and USS San Bernardino County (LST-1110) unloading over the beach at Point Barrow, Alaska, during "DEW" Line support operations, 16 September 1955.